Aside from a segment with Orlando Bloom, Tuesday’s episode of Late Night With Jimmy Fallon was practically a meeting of the Five Timers Club thanks to appearances from two of the show’s most frequent guests: Elvis Costello and Justin Timberlake. Way to ruin the flow, Legolas. In the latest chapter of their ever-developing bro-mance, which most recently featured a simply delightful history of endzone dances, Fallon and Timberlake celebrated #TimberlakeTuesday by reprising their skit “Young Jimmy Fallon & Justin Timberlake Sing at Camp Winnipesaukee”. This go-around, the kids showed some love to Hootie & the Blowfish’s “Only Wanna Be With You”. 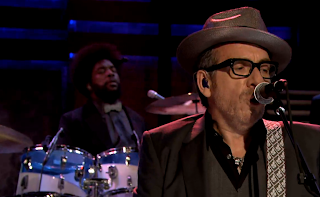 When Fallake Timberllon were done playing buddy buddy, Costello and The Roots performed “Walk Us Uptown” from their just-released collaborative album, Wise Up Ghost. Costello also spent some time on the couch with Fallon, discussing his relationship with The Roots and the show.